OCI-AML2 is an acute myeloid leukemia cell line. OCI-AML2 cells express the retinoic alpha receptor (RAR). Additionally, they contain a DNA methyltransferase 3 alpha (DNMT3A) gene which plays a role in cellular epigenetics. OCI-AML2 cells express VEGF receptor-2 (VGEFR2/Flk-1/KDR), eNOS, and the VEGF ligand involved in malignant hematopoiesis, also known as angiogenesis1. OCI-AML2 cells have been used to demonstrate that inhibitors of VEGF, Flk-1/KDR, and PI3K lead to a decrease in AKT kinase and nitric oxide synthase (NOS) signaling. It has been shown that decreased NOS activity leads to clonal cell growth and some induction of apoptosis1. 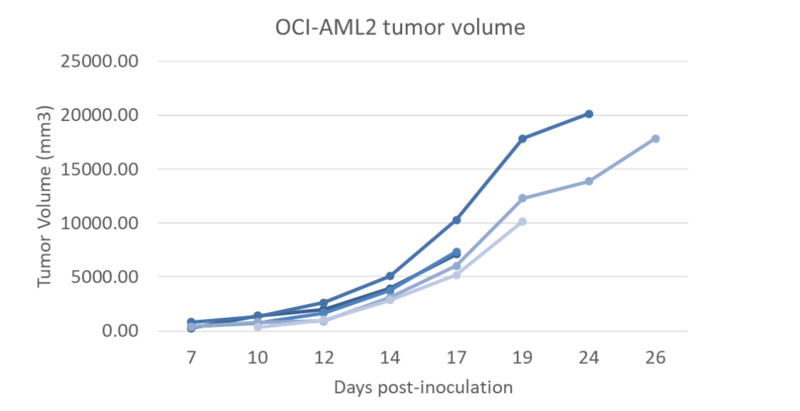 The OncoRat demonstrated a 100% engraftment rate for the OCI-AML2 xenograft model, providing an ideal host for OCI-AML2 tumor biology. Koistinen P, Siitonen T, Mantymaa P, et al. Regulation of the acute myeloid leukemia cell line OCI/AML-2 by endothelial nitric oxide synthase under the control of a vascular endothelial growth factor signaling system. Leukemia. 2001;15(9):1433-1441.